Fire Lieutenant John Sierp, who has appeared on Food Network's Chopped, is working the kitchen at this Kip's Bay eatery. 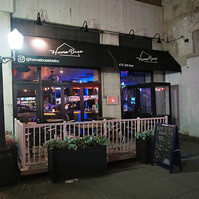 The menu at Home Base Bistro features elevated bar foods like Cuban Egg Rolls, Grilled Shrimp Tacos, Wings with 3 different sauces, Zucchini Fettuccini, along with burgers and sandwiches. There's also a salad called "Chopped" with cucumber, tomato, bleu cheese crumbles and house balsamic.